Nominated for Best Cinematography (Bruno Delbonnel) and Best Sound Mixing (Greg Orloff, Peter F. Kurland, Skip Lievsay). 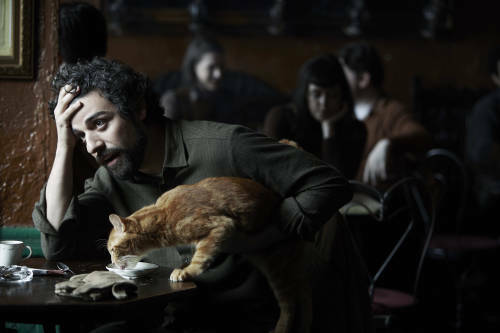 Inside Llewyn Davis is cyclical. It is the depressing period in one’s life after the death of a loved one and partner. It is also a behind the scenes peak at the life and struggled of a folk artist in 1961. More specifically, it is a week in the life of Llewyn Davis (Oscar Isaac). At first we don’t know why, but Llewyn is extremely down on his luck. He is hopping from couch to couch on the sometimes grudging shoulders of friends. His sister is a hard love type of woman and his ex-secret lover is pregnant with his baby while her husband (Justin Timberlake) is helping him out with jobs and connections. It is winter in New York and Llewyn can’t even afford a coat, that’s how unlucky his is. We find out later why he is no longer a duo and his emotional scarring makes him refuse much musical help or the thought of joining a group. He is a rough human being. He heckles other singers and is angry and unforgiving, but somehow he is able to muster the responsibility of taking care of his friends’ cat who follows him out one day. His chase of the cat and his attempt to bring it home is a consistent theme in the film and adds a cute quirk to his character that was needed. The snow, cold, and dark night clubs bring the depression level of the film down and Llewyn’s character arc doesn’t go very far in the span of a week. It is clear that most of the characters in the film are sympathetic to Llewyn and what he has gone through. He has a distinctive surliness that is tough to connect with, yet somehow I was rooting for him that somewhere in the film his life would turn around. We know next to nothing about his history, which makes him a mystery. That is definitely a weakness of the film, in my opinion. It is very obviously a Coen brother film. Having been away from art and filmmaking for a few years now, I find it a lot more difficult to appreciate dark and depressing films. There are little to no redeeming qualities in Inside Llewyn Davis, and to be honest I was at a loss as to what the moral premise was. I felt that the script needed to be more rounded out and complete. However, the cinematography was certainly excellent and painted the mood of the film extremely loud. The folk songs are particularly good and Isaac delivers a good performance. I don’t think that I will ever watch the film again, but if you have love for the Coen brothers, Oscar Isaac, or especially a connection to music, this could be one that you would enjoy.